Sadly, we meet some of our customers at the worst time of their lives. Recently a local resident called us for a complete biohazard cleaning after a family member passed away. The elderly relative had passed some time before being found, and the residence needed cleaned before the rest of the family came into town. Our team of highly trained professionals met with the relative, explained the specific cleaning and restoration process, and we cleaned the property. Customers often ask how we train to clean sites such as this. We explain the detailed level of training our SERVPRO of Wichita Falls team receives, followed by the fact that we treat every site with care and compassion. We can't leave every customer with a smile, but we can help them through extremely hard times with our professional and courteous response. Hundreds of homes damaged as flooding continues to grow in the Midwest. 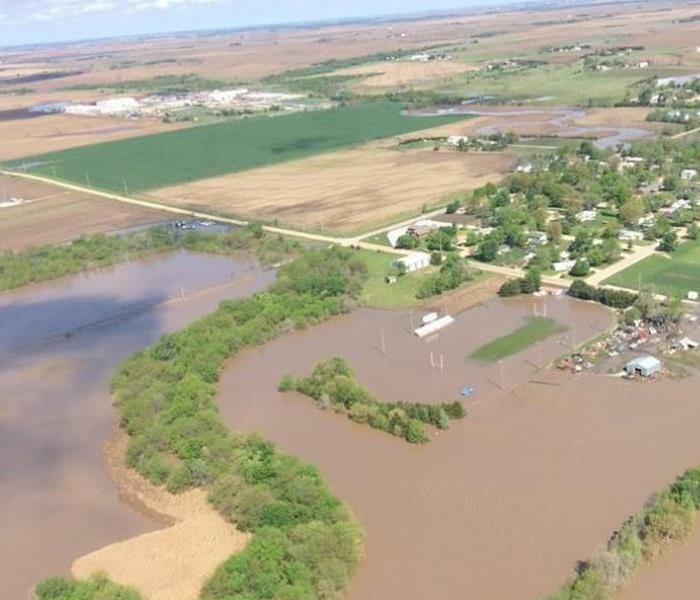 Historic flooding continues in the Midwest, and our thoughts and prayers go out to all who are affected by this disaster. To date, 500 homes in one county have been destroyed. Three people have died attempting to cross flooded areas. Offutt Air Force Base has been inundated by floodwaters, resulting in sixty damaged buildings and the closure of their runway. And a nuclear power station in Brownville, Nebraska is preparing to shut down. The loss and devastation will continue to worsen as rivers rise and overflow their banks. SERVPRO of Wichita Falls continues to monitor this situation, as does all of our franchises. We are part of the SERVPRO Commercial Large Loss Division, which is composed of the best of the best in restoration. Your Wichita Falls team is part of an elite group of specialists who are prequalified and strategically positioned throughout the United States to handle any size disaster. We are faster to any size disaster, both here in Texoma and wherever else we're needed. Fire damage isn't just fire. It's water damage from firefighting efforts. 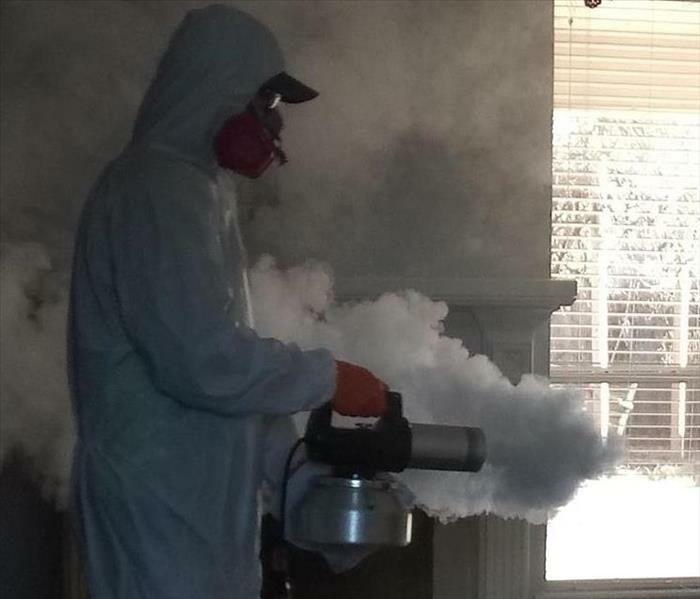 It's smoke that can creep throughout your entire home or business. At SERVPRO of Wichita Falls, we understand your frustration and anger over the loss of your property. Our team of highly trained professionals will inspect your home or business and thoroughly document all damaged areas. We will also check for smoke damage throughout the property, to ensure we can restore your items to preloss condition. This information will be shared with you and your insurance agent, along with our recommendations for restoring your property. This may include determining if the property is safe to remain in place, or if we need to provide our pack out services to secure your items. We will work with the adjuster to determine if furniture can be restored, or if it needs replaced. Once we've completed the steps outlined above, we're ready to begin the restoration process. You may not think it at the time of the loss, but with our help we'll make it "Like it never even happened." 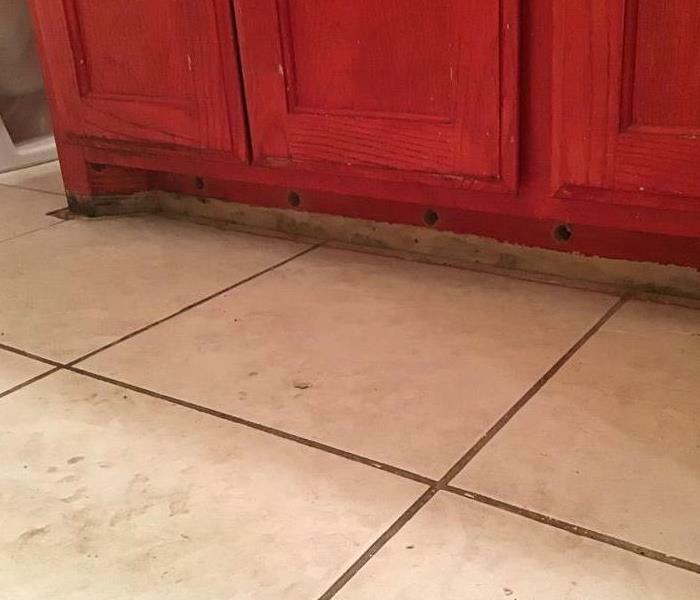 Why are there holes in my cabinets? Water damage varies from clean water, grey water, and flood water. Clean water, like this loss from a leaking water line, can easily be cleaned and dried. Therefore, this cabinet can be restored instead of replaced. Our team of highly trained technicians know the first 24 hours following a water incident are the most important in preventing secondary or permanent damage. That's why we respond quickly to all water damage sites and we immediately inspect the damage. We extract the excess water to prepare the area for drying. We drill holes in cabinetry and install our Injector Drying System to ensure all areas are completely dry. And we monitor all equipment daily, recording the moisture readings and adjusting the equipment as needed to speed the drying process. We communicate our processes to your and your adjuster, and we listen to any concerns you may have. When you have water damage, trust the professionals at SERVPRO of Wichita Falls. Why does it take so long to get my house dry? 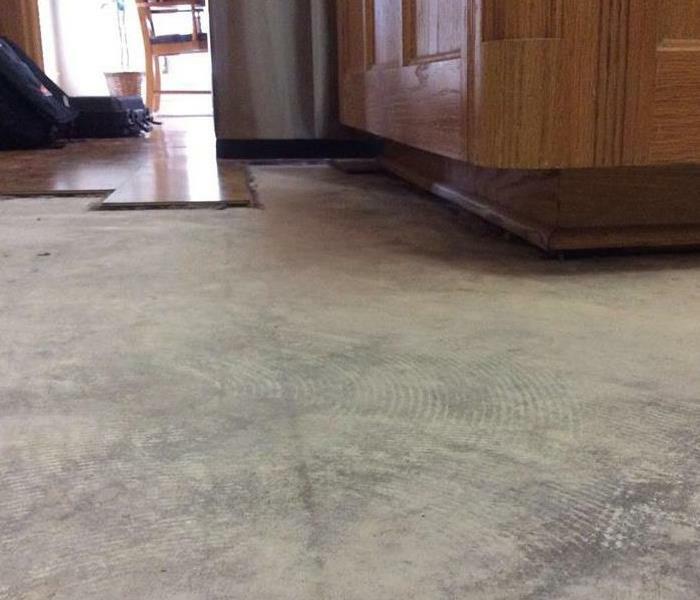 Removing the laminate flooring helps SERVPRO of Wichita Falls get this house drier in less time. That question is one of many we hear after a water loss. SERVPRO of Wichita Falls uses a scientific method of drying to ensure all areas and surfaces are completely dry to prohibit mold growth. When you call our professional team, we immediately begin to document the cause of water damage, the extent of damage, and all surfaces involved. We then create each room in our software, noting the size and surface spaces damaged. When we complete each room addition, our software tells us how many air movers, air scrubbers and dehumidifiers are required to begin the drying process. Our professionally trained technicians are very thorough in their inspection for water damage and the documentation process so that you know every room in your home is either dry, or drying. This gives you, your adjuster, and your insurance agent peace of mind. When will it be dry? A typical house will be dry in about four days, depending on the extent of the damage. Water damage? Call SERVPRO of Wichita Falls today at 940-263-1550. 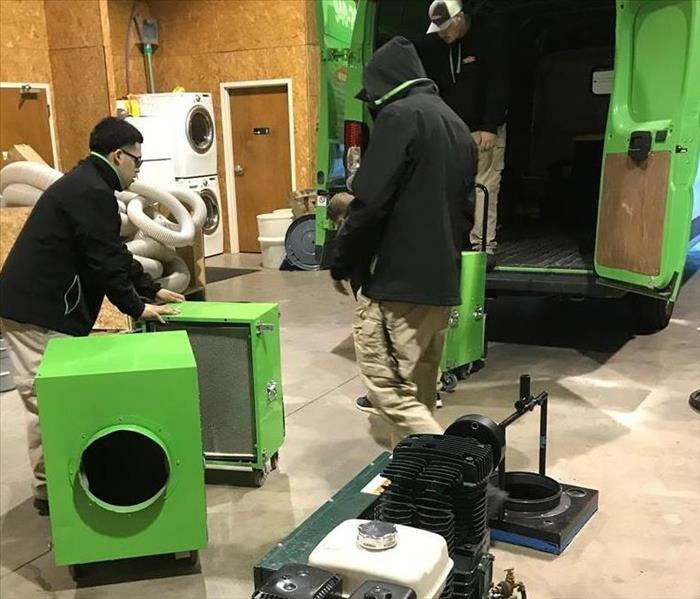 One of hundreds of pieces of equipment SERVPRO of Wichita Falls is loading in preparation for Storm Team assistance after arctic blast hits Midwest. Wind chills of -15 degrees forecast for central Iowa today, as can be seen in the National Weather Service advisory posted below. Your SERVPRO of Wichita Falls team is loading up equipment and supplies, ready to assist the SERVPRO Disaster Recovery team. URGENT - WINTER WEATHER MESSAGENational Weather Service Des Moines IA401 AM CST Thu Feb 7 2019...Significant Winter Storm Will Continue to Impact the StateToday with Dangerous Wind Chills Tonight....After a band of moderate freezing rain, sleet, and snow passedover central Iowa earlier this morning, primarily freezing drizzleand light snow or flurries prevails at this time. The next roundof heavier precipitation is over northern Missouri and will bemoving into Iowa before sunrise. This will spread freezing rainperhaps mixing with sleet over southeast portions of Iowa withsignificant ice accumulations still possible in this area throughmidday today. Farther to the north and west, any lingeringfreezing drizzle will change to snow and then spread eastward thismorning.Strong northwest winds will develop by midday Thursday causingblizzard conditions over northern Iowa this afternoon into thisevening. In the southeast, there is a potential for tree damageand power outages where significant ice accumulation occurs.Hazardous driving conditions are expected over much of the regiontoday into this evening.Another round of bitter cold wind chills arrives late today intoFriday morning. Wind Chill Advisories and Warnings will be neededover much of central Iowa. The SERVPRO Disaster Recovery Team has a network of strategically positioned storm teams on standby should a disaster strike near you. Winter weather advisories give us time to prepare for damage in a disaster. 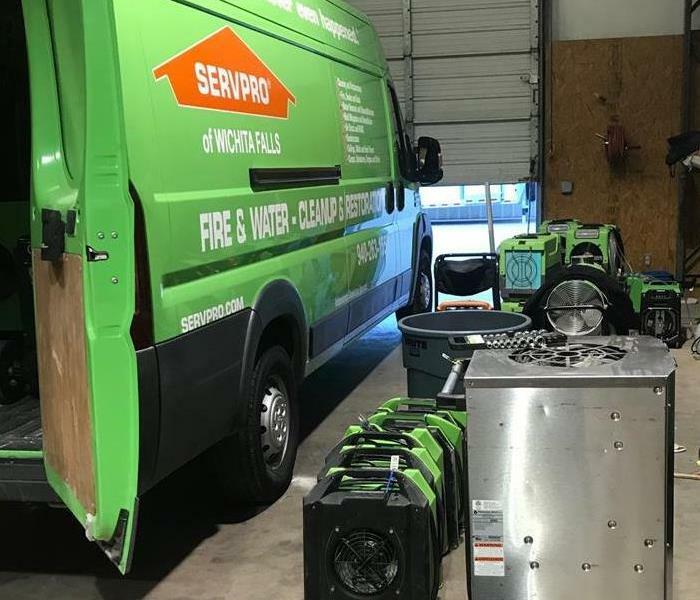 Your SERVPRO of Wichita Falls team is loading up and preparing to join our national SERVPRO Disaster Recovery Team in assisting those affected by the ongoing arctic blast. A 1200 pound heifer can cause significant damage to your vehicle. 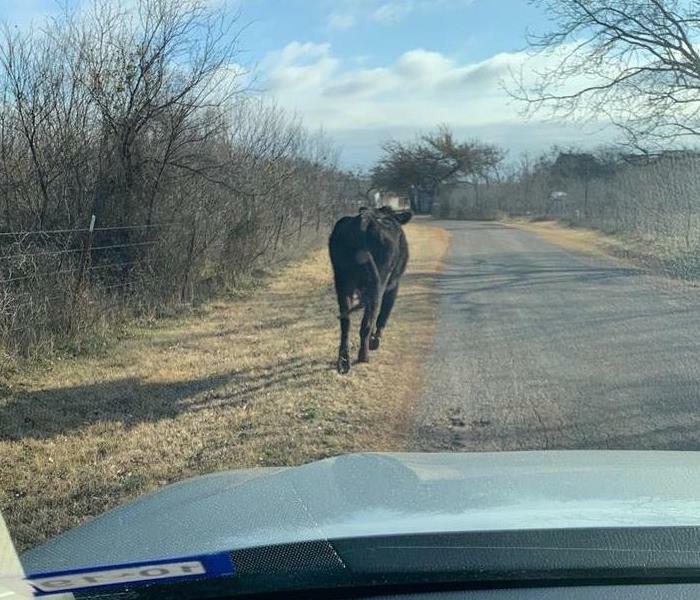 This is the view from owner Kaycee Ryan's windshield as she was coming to work this morning. For those of you city folk, this is a full grown heifer. She can weigh between 1000 to 1800 pounds. And if you've ever run into one with your car, you know the damage that brings. Kaycee and Aaron Ryan, our owners, aren't city folk. They know you have to be prepared for any scenario, and ready for disaster. This morning didn't end in disaster, as Kaycee used her car to herd the heifer back to where she belonged. No harm to the heifer, no harm to the car. It just goes to show how our professional SERVPRO of Wichita Falls team is always ready to respond to any type disaster. Call SERVPRO of Wichita Falls at 940-263-1550. SERVPRO of Wichita Falls takes great pride in being a part of the Wichita Falls community. We understand that communities like ours hold America together. We want to do our part to ensure the Wichita Falls community thrives by helping those less fortunate, keeping the area safe and making our community the best it can be. Owner Kaycee Ryan is passionate about our community, and was recently named President of the Gold Coat Ambassadors for the Wichita Falls Chamber of Commerce. Ryan served eight years as a United States Marine, and is now serving his country with the Air Force Reserve. He organizes and participates in our SERVPRO golfing events. The SERVPRO of Wichita Falls team supports our community and our neighbors. Call us today at 940-263-1550. 3/6/2019 - Why are there holes in my cabinets? 2/27/2019 - Why does it take so long to get my house dry?